Nature inspires much lore. Dragonflies sew up your mouth. Toads give you warts. Bats land in your hair. 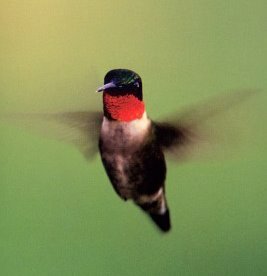 But a magazine, not children or backwoods naturalists, dreamed up a tale about hummingbirds, those hovering micro-birds that just now getting ready to return to Central America. In the 1880s, a writer proposed that Ruby-throated Hummingbirds, which weigh only an eighth of an ounce, couldn't possibly fly non-stop across the Caribbean on their way to and from North America. Without any evidence in hand, he theorized they hitchhiked on the backs of such larger birds as Canada Geese. Today, we know this is not true, yet the speculation has been told and retold till many consider it fact. But as is often the case in nature, fact is more amazing than fiction. Rather than hitchhike, this miniature creature, wings whizzing at 80 beats per second, zips non-stop across 1,000 miles of open sea at up to 40 miles per hour, twice a year. Even more amazing is its metabolism. If you weighed 170 pounds and lived like a hummingbird, you'd burn 150,000 calories a day and produce 100 pounds of sweat. And if you ran out of water, your skin temperature would surpass the melting point of lead and you'd probably catch fire.